Just take a look at all the yummy cookies! 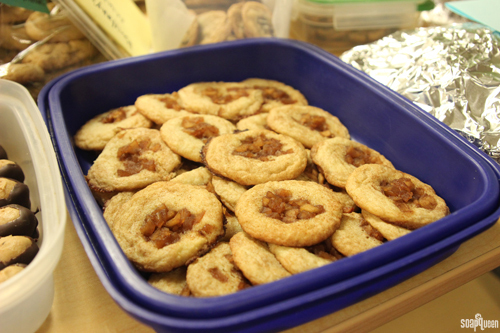 Below are Tina’s “Apple Fritter Cookies,” made with buttery shortbread and spiced apples. They were absolutely delicious, and a great spin on a traditional apple treat. 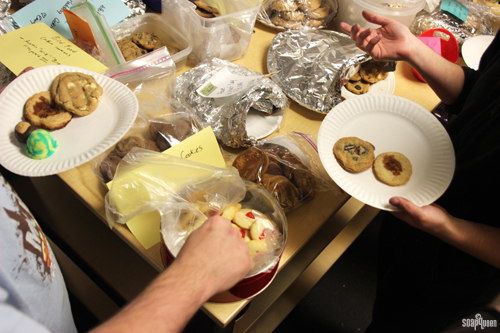 Below, Mike, Ed and Rachel look over their cookie options before diving in. Ed is obviously super excited with all delicious treats, and I don’t blame him! 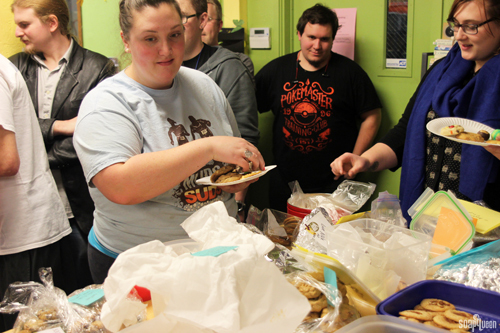 Below from left to right, Ryan, Haley, Austin and Rachel load up their plates with cookies. 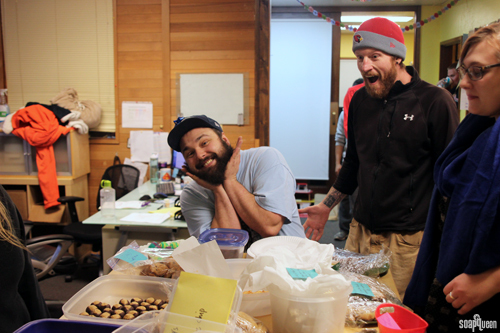 It was a blast to eat cookies and take a little break from the hustle and bustle of the season. Everybody left with at least one new cookie recipe to try out. 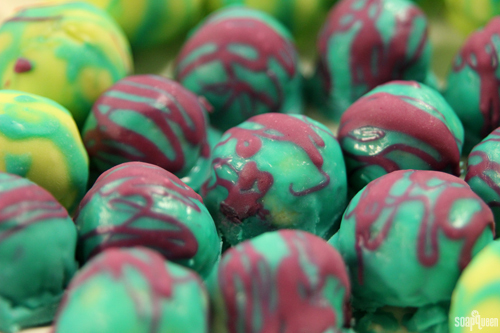 How fun are these colorful cake pops? Made by Haley, they are a great example of her creativity! I love how the bright purple pops against the blue. These treats may have inspired a new soapy project! 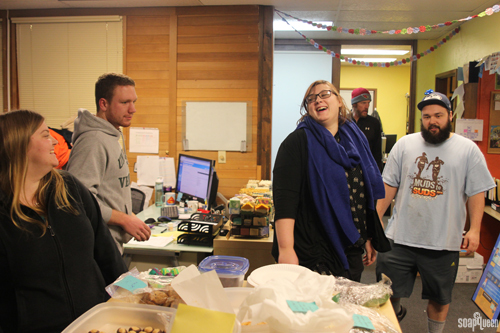 Below, Caitlin, Ryan, Rachel and Mike share a laugh while hanging out around the cookie table. It’s hard to be in a bad mood with so many sugary, delicious morels around. 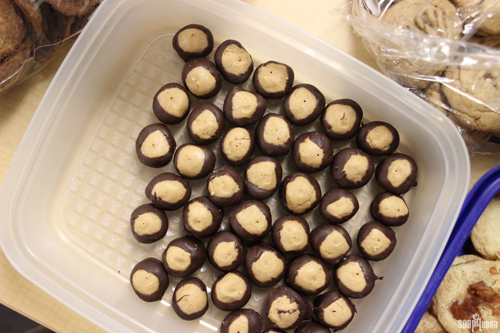 In addition to swapping cookies, the office celebrated Norm’s birthday. He has been eyeing a remote control helicopter drone for a while. He was so excited to receive it! Norm has been flown it around the warehouse several times since the party. It’s hilarious to see him so excited over his new toy. This year, I went rogue and made a savory cookie! Okay, maybe they are technically crackers, but it was nice to have a savory option with so much sugar around. I found the recipe in the latest issue of Martha Stewart Living, and they were a big hit! 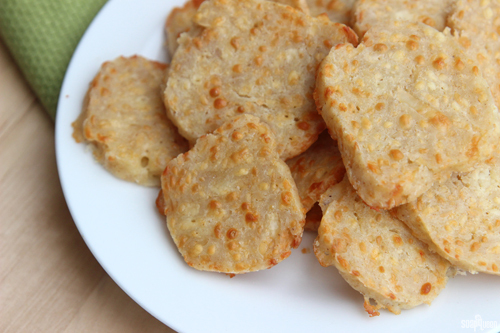 Super cheesy and a little soft, these “cookies” are like goldfish crackers for adults; so incredibly tasty. ONE: In a bowl, whisk together the flour and salt. Work in butter until a crumbly dough is formed. Add cheeses and combine. TWO: In a separate bowl, whisk together Dijon mustard and milk. Stir into dry ingredients with a fork until dough forms. From dough into a 2 inch wide log, wrap in plastic wrap and freeze for at least one hour. THREE: Preheat oven to 350° F. Cut log into 1/8″ rounds and place on a cookie sheet lined with parchment paper. Bake for 14 to 16 minutes. Remove from the oven, and allow to cool on a wire rack. Enjoy! What kind of cookie is your favorite during the holiday season? 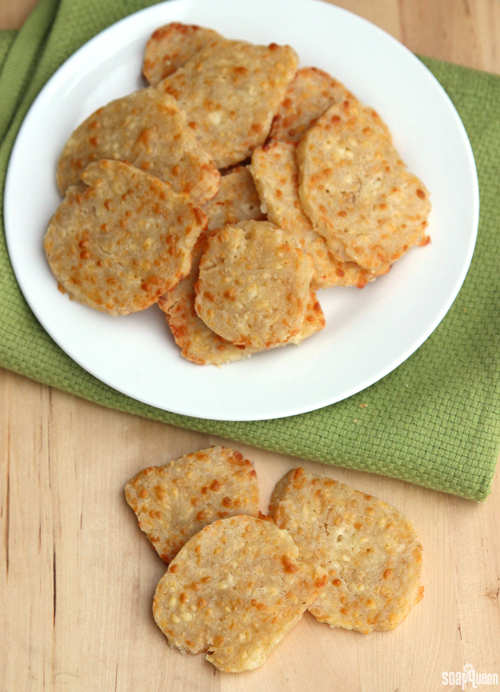 These delicious cracker recipe from Martha Stewart living are perfectly snackable! The original recipe includes poppy seeds, but they have been omitted from this version. In a bowl, whisk together the flour and salt. Work in butter until a crumbly dough is formed. Add cheeses and combine. In a separate bowl, whisk together Dijon mustard and milk. Stir into dry ingredients with a fork until dough forms. From dough into a 2 inch wide log, wrap in plastic wrap and freeze for at least one hour. Preheat oven to 350° F. Cut log into ⅛″ rounds and place on a cookie sheet lined with parchment paper. Bake for 14 to 16 minutes. Remove from the oven, and allow to cool on a wire rack. Enjoy! I’d love to have the apple fritter cookie recipe! If I could live my life anywhere, I’d move to Bellingham so I could work in your place ! Thank you for the wonderful glimpses we have into your community , AnneMarie ! 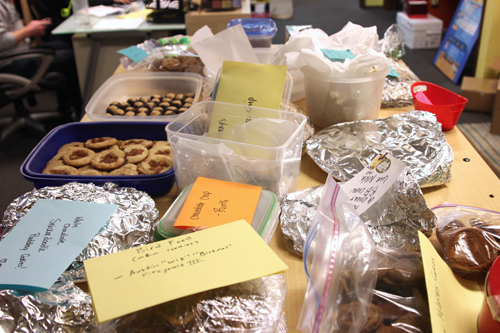 The cookie exchange looks delicious. Those crackers look yummy. Thanks for the printable version of the recipe.